Adventure Island III (高橋名人の冒険島Ⅲ, Takahashi Meijin no Bōken Jima Surī, lit. 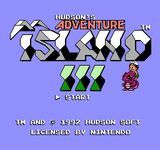 "Master Takahashi's Adventure Island III", spelled Adventure Island 3 on the American packaging) is the fourth installment of Hudson Soft's Adventure Island series and the third game for the NES. It is very similar to Adventure Island II. The game was first released in Japan on July 31, 1992. A North American release followed in September 1992. A Game Boy version was released during the following year. The Gameboy version added Super Mario World style map screens, where the player could backtrack to previous stages and open hidden paths. The Game Boy version was retitled Adventure Island II (Adventure Island 2 on the packaging) in its western release because the Game Boy version of Adventure Island II was simply titled Adventure Island, while the original Adventure Island was never released for the system. The Japanese versions of the Game Boy ports retain their original numberings. Source: Wikipedia, "Adventure Island III", available under the CC-BY-SA License.